We have all heard of destination weddings, anniversary trips, honeymooning and summer vacations. But what about Christmas abroad? Why Not? Experiencing Christmas in another country is always fun but sailing on a cruise, seeing jaw dropping scenery and getting to swim with endemic animals, well that’s an added bonus! Experiencing Christmas abroad is an amazing way to familiarize with a new culture. In Ecuador, we have so many beautiful Christmas traditions that will make you enjoy this special day to the fullest, we also have a way of making tourists feel part of our family. We celebrate Christmas on the 24th of December (Christmas Eve) with a big turkey meal with hot and cold side dishes and a particular delicious stuffing. Before the big day, most Ecuadorians pray the “Novena”, a special prayer telling the story of Jesus’s birth accompanied by christmas carols and yummy hot treats. On board a Galapagos cruise, you will definitely get the Christmas feel with our lovely crew and professional chefs that will most definitely cook up a storm! December is considered part of the Galapagos warm season. Although the weather is great all year round, December is a very special month. The water is nice and refreshing, it doesn’t rain too much and it is altogether a delicious warm place to spend Christmas! Plus, you will also get to see some animals that tend to shy away during other months such as; marine iguanas, sea turltes, flamingos, masked boobied and white cheeked pintails! Don’t worry, Santa Claus also has a pair of flip flops and swimmers and legend says that he uses sea lions to travel around Galapagos while his reindeer have a bit of a much deserved rest! As a traveler myself, I love to live new and exciting adventures on the daily. Getting to meet people from other parts of the world, eating new foods, visiting places full of history and, the animals! I love animals and I’m pretty sure most of you do too! While in Galapagos, I have had the most amazing experiences with these wonderful living creatures. Since the weather is so perfect around Christmas holidays, swimming, diving and walking is so much fun. While visiting Galapagos in December one year, I got to swim with sea lions, marine iguanas and penguins as well as sunbake next to the cutest fury sea lions. One year, my family and I also met a family from California that decided to cruise the Galapagos for Christmas and give their children the gift of travel! Christmas is a moment in which gifts are exchanged between loved ones. It is true, it has somewhat become a materialistic holiday in which presents overshadow bonding time, and a moment to introspect and be thankful for life itself so, instead of gifting away, why not give a heartfelt present that will stay in your memories forever? In my opinion, there is nothing better than gifting yourself and loved ones a trip that will fill you with positive energies, give you the opportunity to open your eyes to the world and spend this amazing holiday experiencing new activities that will enrich you as a person. Imagine spending Christmas Eve sipping a cold glass of chardonnay while watching the sunset with amazing surroundings! You won’t only be spending Christmas in Galapagos, you can choose a cruise itinerary that best suits you! A longer cruise on one of our luxurious ships is perfect as you can enjoy Christmas as well as bring on the New Year on The Enchanted Islands! The awesome staff on board as well as the gobsmacking experiences will make sure that you get the best out of your holiday season abroad. When booking during Christmas season, it’s essential that you complete your reservation within 6 months of your date of arrival given the popularity of this destination. 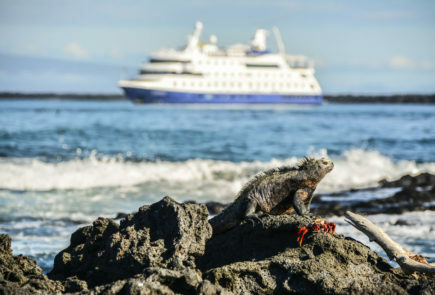 Which Galapagos cruises still have availability and spots open for December 2018?